This week is National Catholic Schools Week. As I reflect on my education, I am grateful to have attended Catholic schools for all but two years and was fortunate to work at a Catholic university for five years. Being a product of the Catholic education system has prepared me well for my current role as Chief Executive Officer of Catholic Charities of Kansas City-St. Joseph. It is here I am applying the principles of Catholic social teaching taught to me from my youth – how to serve others and how to lead an organization in a challenging environment. Given the context of this week, it’s fitting I recently watched the documentary, “Won’t You Be My Neighbor,” which called to mind my childhood. Fred Rogers was the host and creator of the popular children’s television program, “Mister Roger’s Neighborhood.” Like many, I grew up with Mr. Rogers and watched a few of his 1,700-plus shows, but never really internalized who he was as a person, nor did I realize he was an ordained minister. I simply knew he had a huge, positive impact on children. He talked a lot about human dignity, how we are endowed by our Creator, how wonderful we are as human persons and that no person is a mistake. Mr. Rogers even wrote songs to reflect the essentials of human dignity and respect for life, such as “I Am Not a Mistake” and “I Like You As You Are.” He assured us we are loved, just as our heavenly Father loves us. My actions today are guided by these childhood influences. Just last Friday, I participated in the Western Missouri Right to Life Prayer Vigil held in front of the federal court house in downtown Kansas City. 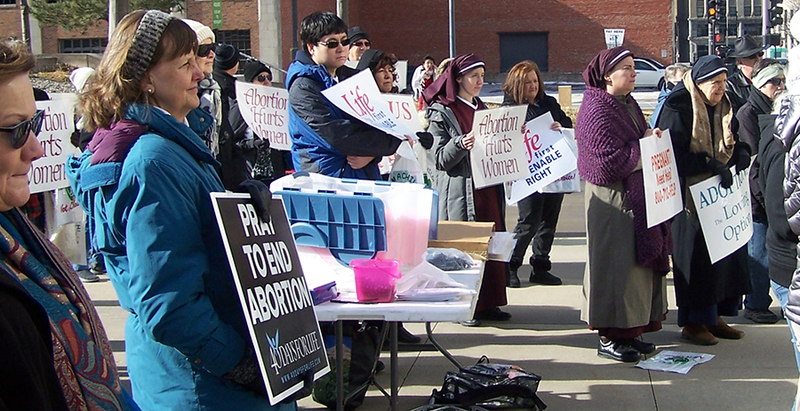 Although the temperatures outside were frigid, we prayed for mothers and their unborn children. I was encouraged this peaceful event was linking our local efforts to the National March for Life in Washington, D.C., with its estimated 750,000 participants – the largest demonstration in Washington each year. At Catholic Charities of Kansas City-St. Joseph, we believe every person is precious and people are more important than things. The measure of every institution is whether it threatens or enhances the life and dignity of the human person. As people come to Catholic Charities many don’t realize their inherent value of being made in the image and likeness of God. In welcoming everyone, we remind them of that inherent value no matter their situation. Our goal is to serve people where they are and to lift them to the dignity of self-reliance. I encourage you to learn more about our work, to volunteer, and to help us serve those in need. Consider being a leader in our community by helping Catholic Charities of Kansas City-St. Joseph serve more of the poor and vulnerable in our area.